I swear Neil Gaiman is like King Midas in some ways. It seems that everything he touches turns to gold. 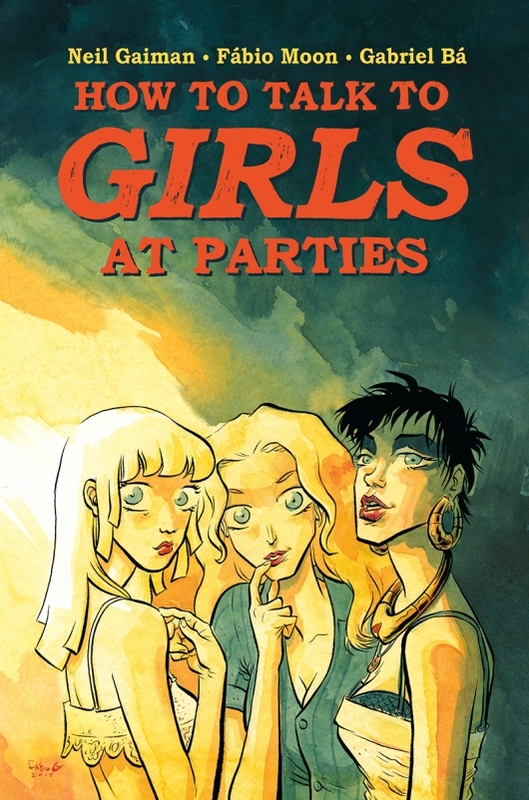 This comic book adaptation of his short story How To Talk To Girls At Parties, is just another example of one of Gaiman’s works being transmogrified in the best of ways. To paraphrase an old idiom: There’s more than one way to re-envision a Neil Gaiman story. I liked the story when I first read it but being the comic nerd I am, I absolutely love this graphic novel in ways I can only barely express. But allow me to try. Check it out below. Loaded with pop cultural references from the 1970’s, How To Talk To Girls At Parties is a decade old short story that originally appeared in Fragile Things. It is a prime example of Gaiman’s work in that it takes what we see as everyday occurrences and turns them on their ear, ever so slightly. In this particular tale, we see a couple of British boys traipsing around looking for a party. Nothing out of the norm there, right? Teens and parties seem to gravitate towards one another on a cosmic level. However, don’t leave the directions behind or you might just stumble onto something that seems out of this world! The two teen boys, Vic and Enn, eventually find the party, though it’s not the one for which they are searching. Strange music, loads of girls, what’s not to like? For Vic, it’s just another walk in the park; he’s a bit of a charmer. Poor Enn, however, has a terrible track record of ending up alone. Personally, I identify with Enn quite a bit. But he tries talking to the girls, he really does. While Vic finds his way upstairs with the ethereal beauty that answered the door, Enn works up the courage to chat with a few of the others. He finds them strangely alluring but not altogether coherent. His attempts at first seem to be not so much rebuked as ignored. The third young lady with whom he finds himself conversing is the one that truly piques his interest. She introduces herself as a poem, a befuddling statement for the poor guy. But when she engages him in conversation, she appears to enlighten rather than bewilder. Whatever amazement that is going through Enn’s head is cut short by Vic’s sudden appearance and insistence that they leave. Immediately. For the wrath that he has awakened is primordial in nature, evident in the gaze of the disheveled girl he has offended somehow. Racing away, the two friends find themselves at odds, though not for long. The epiphany granted to Vic is one that changes him, forcing his mind to expand beyond its normal boundaries. But it is Enn who seems to have truly benefited from the exchange. His world is brighter, sharper, prettier. Where Vic is presented with something vast and omniscient, Enn becomes more attuned and aware of the here and now through the beat of a poem he cannot remember, but one that seems to remember him. Wow. A tiny tale with huge impact. Be wary, be respectful, be present. Gaiman’s story is not dissimilar from many of his other works. Disjointed, but not really. More like a segment of life, of time really, torn out of the past and shown off as if it’s a video from the attic. But with a moral. Aesop was never so articulate as our modern master of the fantastic. But elevating it further by having the twin brothers Fábio Moon and Gabriel Bá recreate it in a comic, well that’s just heavenly. This just took a place in my top one hundred comics of all time. I was moved by the passion from not only the wordsmith. but also from the crafting of panel after panel that felt delicate, graceful, and powerful all at once. I entreat you to find this, to read this, to share this. Few things compare to the sense of wonder I get as I read and reread this comic. On a side note, this story is also being adapted into a motion picture. No rock solid date as of yet, but we’ll keep you posted as information becomes available!